Elevations in Rocky Mountain National Park in northeast Colorado range from 8,000 feet in the grassy wetlands of the montane, to well above 14,000 feet in its alpine regions. The tallest mountain in the park is Longs Peak at 14,259′. 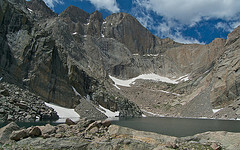 Sitting in a circular basin 2400′ below Longs Peak is Chasm Lake, a mirror of water surrounded by the rocky alpine. More than half the trail to Chasm Lake is above treeline in the alpine tundra, so the views are long and the vistas grand. That also means the hike to Chasm Lake is exposed, so it’s important to get an early start to avoid potential late afternoon thunderstorms, as well as a timely return. This hike took place on July 16, 2009, a beautiful day. We started at 7:00AM and finished about 3:00PM with a lunch break at Chasm Lake. The goal was to ascend the Longs Peak Trail to the intersection with the Chasm Lake – East Longs Peak Trail, pass alongside Peacock Pool and Columbine Falls, then make the final surge to Chasm Lake. We would return on the same path. Trail Condition: Mostly excellent, some rocky conditions. Trail Traffic: Longs Peak is one of the most popular trails in Rocky Mountain National Park. Half of this hike traverses the trail shared with those continuing on to the Longs Peak summit. Crowds can be large, especially on weekends. We encountered probably 50-60 other hikers on this weekday. How to Get There: Chasm Lake is accessible from the Longs Peak Ranger Station and Trailhead along the west side of Highway 7 between Allenspark and Estes Park, CO. The trailhead is located one mile up from the turnoff from Highway 7 that is 7.5 miles south of Estes Park. There is no fee for entering the national park at this location. Parking is limited and the lot fills up quickly in the summer, so get there early. WARNINGBe prepared for a strenuous hike that is entirely above 9,000 feet elevation, with the 2nd half all above 10,500 feet and the destination at 11,760 feet. If you are arriving at Rocky Mountain National Park from other parts of the country that are considerably lower, it is advisable you take a couple days to acclimate your body to the alpine elevations before undertaking this hike. The air is thin, so start with a short hike. Altitude sickness is not fun. We couldn’t have asked for a more beautiful day. My brother and I rose before dawn to get to the trailhead early. Everything we read about the Chasm Lake hike indicated that an early start was definitely called for. First, it is a relatively long hike, so we wanted to be back before dark. Second, there is a very real possibility of late afternoon thunderstorms nearly any day in the Rocky Mountains, no matter the morning weather. Third, there is limited parking at the Longs Peak Ranger Station, about three dozen spaces if I recall correctly. We arrived at the ranger station just before 7:00AM, had our packs and gear ready to go by 7:00, and started out. The parking lot was already nearly full. The trail starts at 9405′. The first 1.8 miles of the hike was in a conifer forest that included lodgepole pine, spruce and fir. We noticed immediately the trail was covered in fresh horse droppings, not something we expected. About a mile in, there is a fork to Eugenia Mine and Estes Cone, but we stayed on the Longs Peak Trail. We passed Alpine Brook, a mountain stream running from high above that was surrounded by bluebells and other greenery. It was a steady but gradual grade upwards to 10,600 feet. We crossed a cascade of Roaring Fork, that stirred the senses. The smell of fresh mountain water and air, mixed with the sound of the stream roaring quickly down, and the visual of the forest and wildflowers surrounding the cascade reminded me why I do this. It is stimulating. Not long after crossing the creek we popped above treeline into the alpine tundra ecoregion and got our first glimpse of the surrounding geology. As we continued climbing we could see the Denver area to the south, Estes Park to the east beyond Twin Sisters Peaks, and the tower of Longs Peak peering out just behind the next ridge to the north. We soon learned why there was so much horse poop all over the trail, as a group of horses approached and passed us. We found out later what they were up to, but it sure made an otherwise fabulous hike one of being especially mindful of each next step. 2.8 miles up the mountain, at about 11,000 feet, there is a spur trail to the Battle Mountain Group campsite. Camping reservations and permits are required in the national park. The tundra was a colorful mix of lichen and wildflowers, grasses and stone. Mid-July is a perfect time to get the peak of the flowering season, a stunning sensual delight. Other than pausing for an occasional breather, the scenery was so splendid I was hardly thinking about how much we were climbing. Roughly another mile past the group campsite, 3.7 miles into the hike, there is a shelter that signals the split in the trail. The right fork continues its relentless climb up Longs Peak, while the left was the one for us. It continues on to Peacock Pool, Columbine Falls, and eventually to Chasm Lake. The trail hugged a narrow ledge several hundred feet above a gorge carved by glaciers millions of years ago. There is a series of ponds, including Peacock Pool, an aptly named basin of green and blue hues. From here we got our first glimpse of Columbine Falls with its two 100 foot cascades that rivals Yosemite for sheer beauty. The lower falls spills directly into Peacock Pool, while the upper falls is a couple hundred feet above. The trail itself crosses directly over the top of the upper falls and offers a striking view down the gorge of the lower falls and the pools below. This is a really cool spot that had me nearly breathless, both from climbing and the sheer beauty. There is a bit of a wetlands meadow above the upper falls that is a good place to rest before the last push to Chasm Lake. Kind of hidden among the boulders that have fallen from above is a park service shelter for search and rescue during the winter months; for the ice climbers who love to challenge Columbine Falls. Another large group of pack horses arrived while we were there, and we came to understand what was happening. The Park Service was resupplying the shelter while the weather was nice to get ready for the next winter. We just happened to pick that day. The final 1/4 mile to Chasm Lake is the hardest part of the hike. There really is no marked trail, it is a boulder field that is very, very steep. Being more than 11,500 feet, I could feel the burn in my lungs and thighs of oxygen deprivation. Chasm Lake has a different kind of beauty. It is an alpine lake. There is no greenery surrounding it, quite a bit of snow left in the large pockets beneath the mountains that don’t get much sun, and the diamond-shaped tower of Longs Peak rising directly above. The east face of Longs Peak is known as “The Diamond.” To the left (south) is Mt. Meeker, itself a 13,911 foot giant, and to the right (north) is Mt. Lady Washington, at 13,281 feet no slouch herself. There were probably two dozen other hikers who had started even earlier than we did who were now sunning themselves on the boulders that surrounded the eastern side of the lake. Our cameras got a workout. After enough time to fully absorb the scene, we pulled up a nice smooth boulder and enjoyed lunch in the alpine air. The sky was a deep, deep blue that reflected in the translucent water of Chasm Lake. We did not want to leave. Best HikeBut, we remembered the potential of afternoon thunderstorms, and meandered our way back to the trail. On the way out, a group of young women asked my brother if he would take their picture with the lake in the background. When he asked, “With your camera or mine?” I had to turn around so they wouldn’t see me stifling a huge laugh. The hike back down is just as remarkable as the ascent. The sun had changed positions through the day, of course, so many of the scenes looked new with different shadows and lighting. The columbine were a brilliant blue, and the alpine avens, purple fringe and bluestar made a flowery ground cover. We caught a beautiful afternoon view of the Twin Sisters Peaks with puffy white clouds hanging above like a canopy. I have to admit to getting a bit tired once we dropped back down below treeline and had to keep slogging through the forest that last mile and a half. All in all, though, this was a spectacular day. I rate it as one of the best hikes I have done out west.